Key control register helps to maintain purpose of the key control for protects the properties, life and security of facilities of company. Key controls helps to mange all keys & permission access credentials will be managed issues, duplicated, store, and control by the key control authority. For manage key control required to define key control authorities, storage & maintain authorities to localized personnel controls on keys. For Controlling on key company should assign the person who handle the keys on levels of the controls possible or authorized departmental persons having a abilities to control the key management within department. 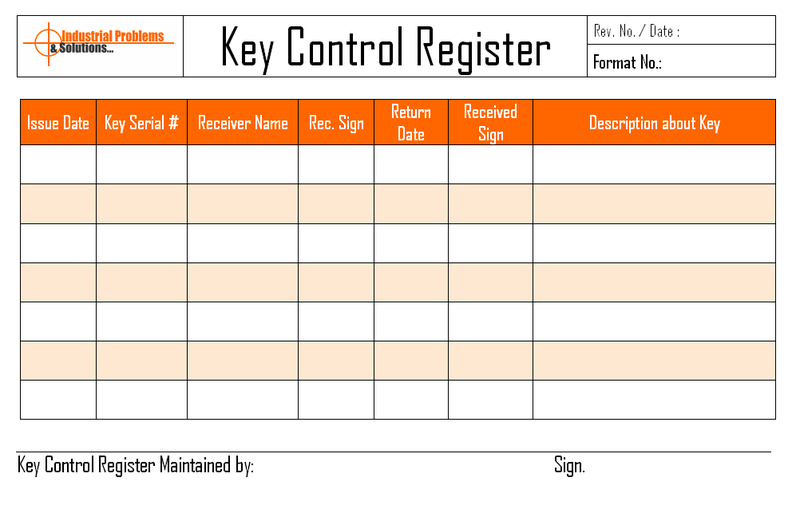 How to maintain key control Register? Description about key and work purpose. All keys shall be authorized by company & specimen signature for the issuing keys, this key can use for the company works respectively. Company should define key control policy & key control procedures to key controllers should use keys in manner. Key should be issued only to individual genuine need for key.